We often say that music is ineffable, that it does not refer to anything outside of itself. But if music, in all its sensuous flux, does not mean anything in particular, might it still have a special kind of philosophical significance? 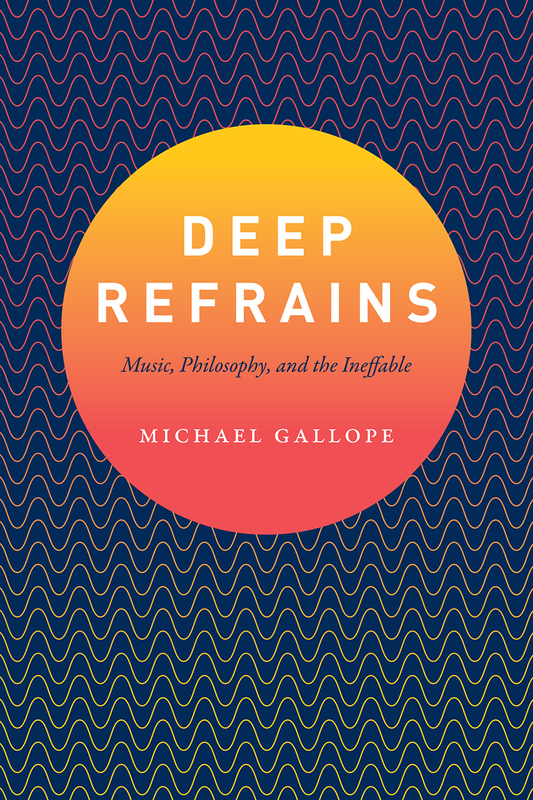 In Deep Refrains, Michael Gallope draws together the writings of Arthur Schopenhauer, Friedrich Nietzsche, Ernst Bloch, Theodor Adorno, Vladimir Jankélévitch, Gilles Deleuze, and Félix Guattari in order to revisit the age-old question of music’s ineffability from a modern perspective. For these nineteenth- and twentieth-century European philosophers, music’s ineffability is a complex phenomenon that engenders an intellectually productive sense of perplexity. Through careful examination of their historical contexts and philosophical orientations, close attention to their use of language, and new interpretations of musical compositions that proved influential for their work, Deep Refrains forges the first panoptic view of their writings on music. Gallope concludes that music’s ineffability is neither a conservative phenomenon nor a pious call to silence. Instead, these philosophers ask us to think through the ways in which music’s stunning force might address, in an ethical fashion, intricate philosophical questions specific to the modern world. "The key virtue of Michael Gallope’s book is that it articulates a framework within which the often dense and puzzling writings on music of four apparently very different philosophers can be seen as bearing productively on one another—as sharing thematic preoccupations, even as they disagree (sometimes radically) about the most illuminating ways of investigating them and about their ethical and political implications. Gallope achieves this by treating all four primarily as philosophers rather than as theorists of music and by relating them genealogically." "Gallope’s aim is to show that there is a common thread running through four fabled music-philosophical projects of the twentieth century: those of Bloch, Adorno, Jankélévitch, and Deleuze/Guattari, which have seemed separated by profound divides between national traditions, and to take radically different stances towards the question of musical signification. He shows that this view – espoused for decades – misleads us, and traces their shared perplexity, a fruitful befuddlement about music that represents their common ground. As marvelous as Gallope’s explications are – and the realigning of twentieth-century music philosophy is extraordinary – his work here is also punctuated throughout with original speculation, and the result is one of the most important books on music philosophy to appear in decades." "Writers on music often encounter the ineffable only to glance quickly off of it, launching a defensive salvo in retreat. In Deep Refrains, Michael Gallope moves in the opposite direction, meditating ever more intently on music’s aporias, which he maps in exhilarating philosophical detail. Eschewing polemic in favor of nimble argument and generous explanation, Gallope opens our ears to arresting sympathetic resonances between diverse thinkers—Schopenhauer, Bloch, Adorno, Wittgenstein, Jankélévitch, Deleuze and Guattari—all of whom have confronted music's potential to elude talk. Gallope deftly braids their insights to reveal a music at once deeper and more precise than we had known." "Lucidly presented and penetratingly insightful, Deep Refrains reads the most important twentieth-century reflections on music’s ineffability – on the complex ways that music contributes to verbal conceptualization precisely by exceeding conventions of conceptual reasoning. Gallope’s compelling and highly intelligent interventions draw out the ramifications of musical material for contemporary thought, signaling music’s promise without neglecting its subtle perplexity: A resoundingly masterful accomplishment in every sense."